Tracy brings years of experience in the animal bodywork field and a great vision for RMSAAM. In her quest for learning, she has attained a broad range of certifications for horses and companion animals including: craniosacral therapy, massage, the Tellington TTouch Method, Shamanic healing work, essential oils and herbalism. Animals have been her most profound teachers. In addition to teaching she’s been providing complementary healing and performance solutions for over 20years through her company The CranioConnection. Tracy has been teaching equine and canine massage and herbal courses at RMSAAM for over 7 years and is excited to step into her new role. 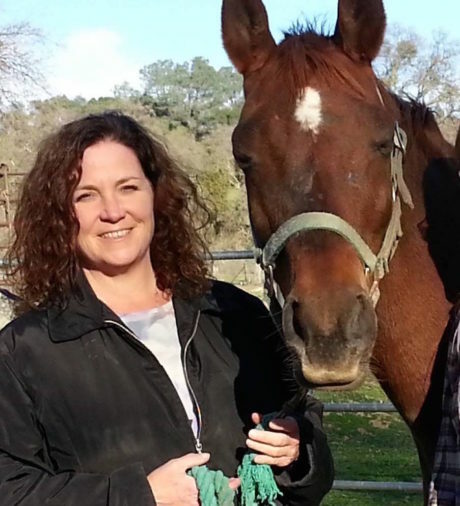 With over 25 years of Equine Massage experience, Lori will also share her knowledge and experience through RMSAAM as an instructor. She brings an extensive background in Equine Craniosacral, Shamanic Healing, herbalism and energy healing modalities such as Jin Shin and sound healing. Years of rehabilitating horses have taught Lori that wellness is a process worth investing in. Uncovering the treasures that can be hidden beneath a trauma, injury or illness brings wholeness to equines and enriches their partnership with humans. These possibilities continue to inspire her daily. 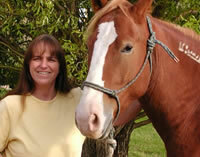 Mary has over 25 years of experience riding and showing horses. She recently moved from Colorado to her farm in Paris, KY where she cares for her horses and dogs. Mary’s previous career in orthopaedic research allows her to understand equine and canine biomechanics and the importance of understanding how bones, joints and soft tissues move in their bodies. She understands how the scientific community treats various ailments but also realizes that there is a place for complementary treatments. Integrating other modalities with traditional medicine can really benefit the animals. Mary completed her studies in craniosacral therapy and herbalism. She realizes the importance of working with animals and their humans so they can better enjoy their competitions or companion animal time in harmony. She likes attending workshops and conferences so she can expand her knowledge in the holistic arena. Beth is a Certified Large and Small Animal Acupressure Practitioner, Animal Acupressure Instructor, and owner of Equine Energy Works, LLC. In addition to Traditional Chinese Medicine (TCM) and Acupressure, Beth has also studied Dr. McLaren’s Photonic Light Therapy and other vibrational healing modalities including equine massage, Bach Flower Remedies therapy, floral acupressure and aromatherapy. Beth believes in a balanced approach to animal health care including good nutritional support, exercise, natural training techniques and regular preventative maintenance acupressure and vibrational energy work. Beth’s passion is teaching animal owners and caregivers TCM and animal acupressure to help them support their animal’s health, experience the strong bond and cooperative partnership energy work creates with animals. Heather has been a horse enthusiast her whole life. She began working with horses around 2009 taking hunter/jumper lessons and then began working as a trainer’s assistant. She went on to be a horseback trail guide, beginner horsemanship and riding instructor, and had a brief job as a professional groom before deciding to pursue her career in equine massage therapy. She earned her massage certification in 2014 from RMSAAM and began her own massage business. She continued her education through an equine rehabilitation internship and has enjoyed studying many different modalities of bodywork in order to always evolve and improve her massage practice. Working with horses is still her passion outside of her business and family life. In her free time she enjoys showing her own horse in local English Pleasure shows, participating in cow clinics, and trail riding all over Colorado. Amber Snow grew up in Maine surrounded by nature and beauty, and has been fostering her deep love for animals her whole life. She has lived in Colorado since 2017. She truly loves being a Canine Massage Practitioner, and holds a special place for special needs, older, and rescued dogs. Amber’s blind Boston Terrier, Slater, was her original inspiration for pursuing canine massage certification, and has taught her so much about life. Amber also holds a Master’s Degree in Music. As a believer in the power of both massage and music on multiple levels, she incorporates the many benefits of music into her massage sessions. Amber’s passion is helping improve quality of life, for both dogs and humans. Frances Fitzgerald Cleveland has worked with horses for more than 25 years in a range of disciplines. Her aspirations started with horses and grew to include people and other animals. In 1996, Frances founded her company, FrogWorks. She has always aimed to heighten the well-being of people and animals naturally, through individualized use of essential oils. Frances has extensive experience in the realms of health and behavior as it relates to both animals and humans. She obtained certification from the Institute of Dynamic Aromatherapy and the International School of Animal Aromatics. Frances studied in England with Caroline Ingraham, the pioneer of Animal Aromatics. Frances is an apprentice of Rosemary Gladstar, world renowned author, herbalist and teacher, and has completed the intensive Apprenticeship Program and the Science and Art of Herbalism Program in the didactic, therapeutic, laboratory and fieldwork in herbalism. Frances recently trained zookeepers in the use of essential oils on animals. Her groundbreaking Animal Aromatherapy work at The Denver Zoo with the Orangutans, Gorillas and Black Crested Macaques was covered in the Denver Post and L.A.Times. Frances’ work has also been written about by the Rocky Mountain News, Associated Press, The German Press and a featured guest on Animal Radio. This work showed excellent results, which confirm the effectiveness of essential oils. These magnificent animals clearly demonstrated which oils they wanted, when they wanted them and how they wanted them applied. They have truly been teachers about how these oils can help them. Her specific expertise, her love of animals and people, and her commitment to natural healing make Frances a respected and highly effective Aromatherapist. Frances and her husband, John, live in Colorado and operate a horse facility, Outback Farm, where Frances teaches and practices Aromatherapy, trains horses, gives riding lessons and manufactures her internationally sold products. Throughout the United States, Australia, Europe, Denmark, Canada, Holland, Sweden, Norway and New Zealand, Anna Twinney has conducted classes, clinics, and training sessions; teaching the art of creating trust-based partnerships between humans, horses, and all other animal companions. Anna is a well-respected and internationally known Natural Clinician, Trainer, Animal Communicator, and Reiki Master. Based in Golden, Colorado, Anna is the founder of Reach Out to Horses®. Her dream is to take her organization around the world and especially in third-world countries, working with people and their horses, teaching them about her ground-breaking methods. Drawing on a lifetime of equine knowledge and experience, and over ten years of coaching international students, some with learning disabilities and physical challenges, she has imbued her clinics with a wealth of information, integrity, and compassion.Anna is also the creator of the Reaching Out to Natural Horsemanship DVD Series and can regularly be heard on radio and podcasts around the world including her popular podcast show Reaching Out with Anna Twinney. Anna’s interview about Animal Communication can be heard on the Canine Wellness Radio show:http://www.blogtalkradio.com/caninewellness/2011/06/13/animal-communication-interview-with-anna-twinney. Her work has been featured on TV, including Martha Stewart’s Living “The Horse Whisperer” and the BBC fly on the wall documentary “Living in the Sun”. In addition, Anna has written articles for a variety of national and international equine-related magazines, and is a contributing author of Horse as Teacher: The Path to Authenticity with Horses, released in May of 2009.Anna has also worked in collaboration with other leading clinicians on natural horsemanship and animal communication. Beyond her own equine training and experience, Anna has explored a number of “alternative” healing modalities over the years, including becoming a certified Karuna® Reiki Master and Intuitive Healer. She has studied Equine Herbal Natural Remedies and Aromatherapy, is a certified Reconnective Healing® Level III practitioner, Level II Healing Touch for Animals practitioner, and a graduate of the Carol Gurney HeartTalk Program® as a certified Animal Communicator.One of Anna’s great passions is the survival and protection of wild horses, and she has been privileged to observe Brumbies in their natural habitat in Victoria, Australia along with colleague Eric Godward. She also assisted Neda DeMayo in the Santa Ynez Valley at the wild horse sanctuary ‘Return to Freedom’ for a number of years. RTF is home to the American Wild Horse and is considered a living museum. It provides a natural environment for the horses to live in herd groups, and a place students can observe natural wild horse dynamics. Anna was part of the education program and played a significant role in gentling mustangs for special care and foster homes. She continues to support a number of Charities including the Equine Angels Rescue Sanctuary in Connecticut, the The Horse Protection League in Golden, CO, Zuma’s Rescue Ranch in Littleton, CO, and Equine Voices Rescue and Sanctuary in Tucson, Arizona, where she is actively involved as an Advisory Board Member. Ken Bain is a Texas Licensed Massage Therapist and Massage Therapy Instructor, specializing in non-invasive trigger point therapy using massage techniques. Ken is a graduate of the Texas School of Massage, the Institute of Trigger Point Therapy, Pet Massage in Toledo, OH, Massage Awareness in Wellington, FL, and is credentialed in Colorado as a graduate from the Rocky Mountain School of Animal Acupressure and Massage. He is a member the International Association of Animal Massage and Bodywork and the Associated Bodywork and Massage Professionals. 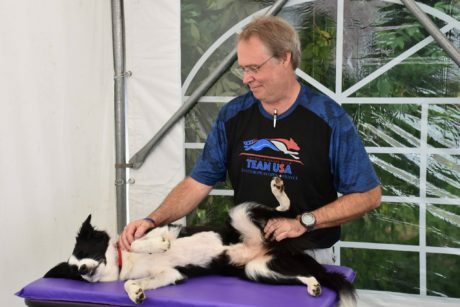 After training and competing with canine athletes for over 15 years, Ken realized the importance of massage in keeping these athletes in peak condition. In 2006, Ken started developing trigger point therapy for canines through several years of working on the canine athletes (agility, flyball, and Frisbee competitors). Since 2010, he has been teaching canine trigger point therapy techniques. Besides teaching, Ken has a full time hands-on practice including working regional, national, and international competitions. In 2016, Ken was selected to travel with the USDAA and AKC World Teams as the teams’ therapist for the World Agility Championships (the Netherlands) and European Open Agility Championships (France), respectively. He has also been selected as a speaker in multiple national and international educational conferences. Ken has been providing bodywork for the canine athlete since 2003.